I’m lucky enough to have a job a lot of young girls dream of, I’m a fashion publicist*. This week I took a trip to New York for work, and I'm ready to give a glimpse of my life behind the scenes as a fashion publicist, from the glamour to the grit. Meeting with fashion editors at magazines from Elle to Lucky to Glamour, and the list goes on. Oh yea, VOGUE. 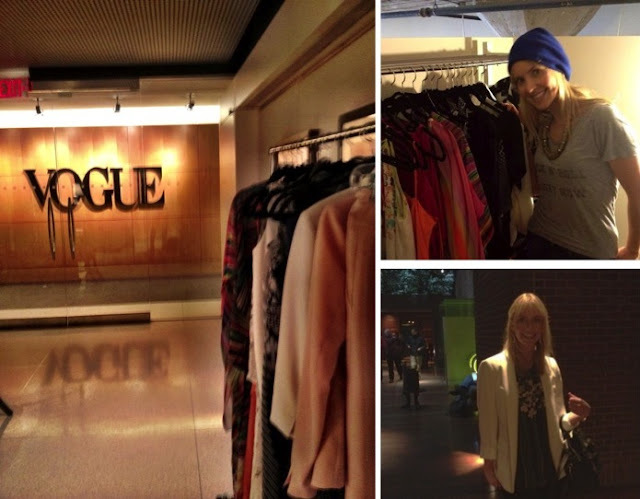 How did I get to go to Vogue?! They obviously didn’t think I was going to take stalker photos, but I did, so shhhhh don’t tell. What did I do when I met with these fab fashionistas? Well, I can’t reveal all my “publicist secrets”, but it’s mostly reviewing clothing lines and discussing where they fit in the publication at hand. Running around New York in heels, throwing elbows in the rain to catch a cab, all with a rolling suitcase and a garment bag in tow. Side Note: This is definitely a time that being blonde helped. In a sea of brunettes and suits I stood out to cab drivers and got lucky not to have any problems. If I lived in New York though, I would invest in these Kate Spade Taxi mittens. Getting stuck in the revolving door of the Hearst building. Yes, it happened. But I had to shake it off and forge ahead because when you’re a fashion publicist you can’t let things like doors stand in your way. Waking up at 5am to catch a flight and being seated next to someone refusing to take off their Mardi Gras mask and make-shift t-shirt turban…WTF!? Then there was The Hudson Hotel. Sleeping, eating and working at a “hip” hotel sounds like a dream, until you step into your 8x8 cell, I mean guest room … Usually the hotels I stay at are great, but this time…well, you know, they can’t all be winners. And finally, there is what I'm experiencing now, jet lag so bad I look and feel as if I partied like I was 21 again. In addition to 12 editorial meetings, I stopped by a company event at the Bryant Park Hotel and met with a cool new denim line. Sound busy enough to you yet? Don’t forget that just because I was running around the city for two days, my regular work didn’t stop. By “regular work” I mean things such as preparing samples to be sent for magazine shoots, emailing with clients, writing pitches and press releases, following up with media on stories in the works, etc. etc. etc. 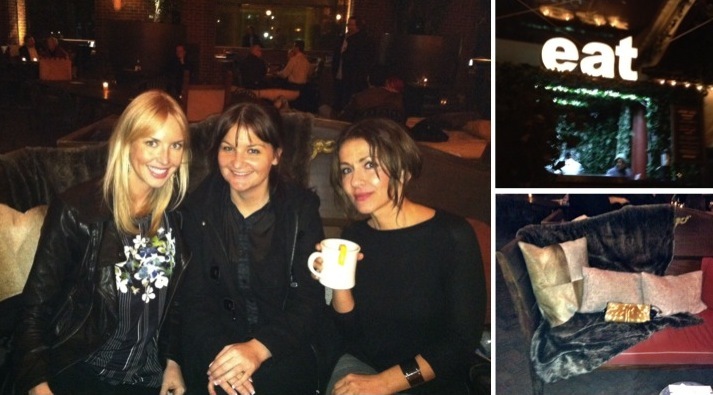 Tuesday night I met with friends at the Hudson Lodge for some much needed cocktails and girl talk. Despite the lackluster Hudson rooms, the bar area is uber cool and my drink was like an alcoholic chocolate milkshake, i.e. heaven. Finally, I made sure to squeeze in a bit of power shopping at Saks Fifth Avenue. The sale items were picked over in my size but there’s nothing like a little window shoe shopping to make a girls’ heart sing. My trip to New York this week was hard but it was exciting, and the adrenaline is what I thrive on. With all said and done, I can’t wait to do it again! *In addition to working on public relations and marketing for fashion companies, I also work with products including consumer electronics. I have a serious fear of getting stuck in an elevator so I would have freaked out! This is so exciting! So happy for you that you have a job you love! You trips sounds like it was great! I work a few floors down from Vogue, I could have totally run into you! And people take pictures all the time haha myself included! I'm glad I'm not the only one sneaking photos on the DL - I thought I was going to get busted by security at any second! Great post Chelsea! 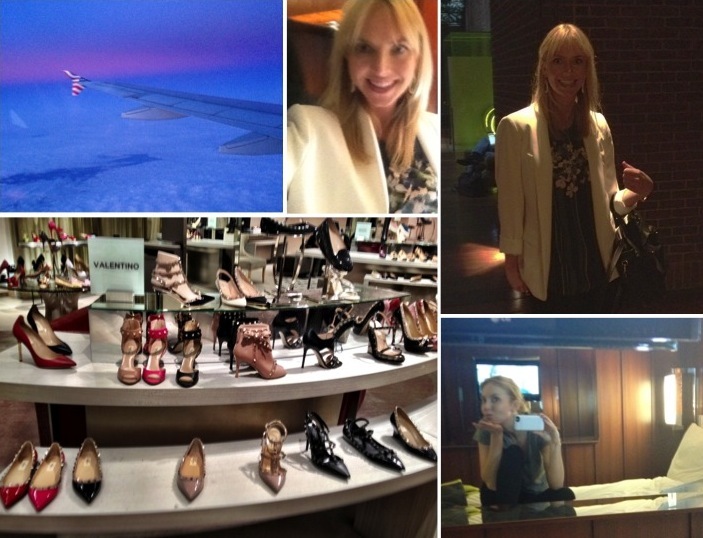 It's fun to get a peak into the life of a fashion publicist! I'm laughing at your description of the Hudson Hotel. We've stayed there too-and though I love the rooftop bar and lovely terrace-the room was tiny!! that was a fun read! lots of work but so much better than being stuck at a desk! This is my absolute dream job, going to school for this right now! You are living my dream! I hope you are living it up to the fullest. Enjoy, and great blog! Loved reading about your trip lady!